This paper cup turkey craft is an easy Thanksgiving craft for kids and cute enough to use as a decoration on your Thanksgiving table or your mantle. This is kind of a messy craft (what else would kids want?) so make sure your work area is covered with something and that your kids have on clothes that you don’t mind them getting paint on. Small paper or foam cup. Paper will work well as long as it’s a sturdy cup. Small foam heart for gobbler (to contrast with color of head). You can cut out a heart shape if that’s easier. Small foam triangle (orange or yellow). Try to contrast this with the color of the gobbler so it stands out. White craft glue and glue gun. Place cup upside down on work surface and paint it brown; let dry. To make the feathers, have your child draw an enlarged hand print of his or her hand on the white sheet of construction paper. Paint the hand print with multiple fall colors, crisscrossing colors to create a feather effect. Once dry, cut out the hand print and trim the tips of each finger into a point. Glue the hand print to the back of the painted cup so that the feathers stick up; let dry. Take the foam heart and turn it upside down. Glue the triangle so it points down from the top point of the heart. Glue the combined heart/triangle gobbler and beak onto the pompom about half way down. Add the googly eyes just above that and then glue the whole pompom head onto the top of the cup.Cut two feet from the orange foam sheet and glue to the bottom of the cup. That’s it! 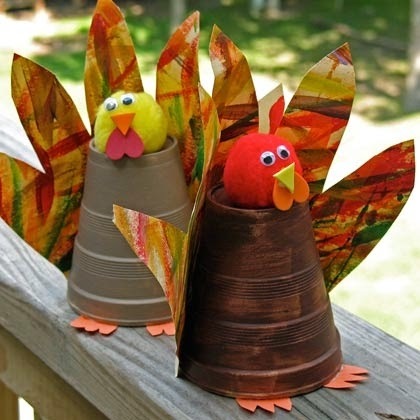 You now have a cute turkey decoration that’s an easy Thanksgiving craft for your kids to make!